Well the day kind of started the day before. That being Thursday night. Finished work at 5pm and then headed straight to Woolworths to do food shopping, stocking up for the next few days away. After an hour and a couple of phone calls to my helpful mum I was not really any better off than I was when I arrived, just $150 worse off on the credit card. After getting home and unpacking the car was in dire need of a wash. So that took up the next two hours cleaning the car and fitting the car-bra for the drive down in the morning. By now it was 9pm all I wanted to do was go to be and sleep. Not likely. I had to organise all I needed to take with me the next day. So for the next three hours I ran around my small home virtually working out how to take everything with me. One bag packed with all the riding kit I own. Another with clothes to wear while not on the bike. Then food. This was interesting. Anyways story short after getting all I thought I would need in some kind of order it was after midnight and I also had a couple of unexpected visitors to add to the equation. 0715 and the alarm went off. I was excited but just wanted to sleep. No time. I had to slowly wake the sleeping dead visitors (who came to help back but only passed out) and work out a way to get half my house packed away in the car. This was a huge challenge. By the time I got all I had planned to take I was like. How was I going to fit everything if Jamie is planning to bring just as much as me. Eventually I just gave up and thought will have to find a way. Luckly once arriving at Jamies all he had was a small suitcase, his bike and a small esky. This was easy to fit in the car. So we were away by 0930.The trip down was un-eventful and we arrived at the camp around 1230. Bikes were nice and safe in the back seat of the car. did not move an inch on the whole trip down. After unpacking the car and picking out a bed Jamie and I took a drive to Margaret River to find a bakery and some lunch. It was this point I worked out the one thing I had forgotten to bring. My power bars and gels I had stocked up on. I bought a couple that were close to it and will have to do for tomorrow. When we got back to the camp El President was only just arriving and the others were getting ready to head out for the afternoon ride. Scrambling to get ready both Jamie and I seemed to get ourselves organised and headed out the front with the rest of the crew. 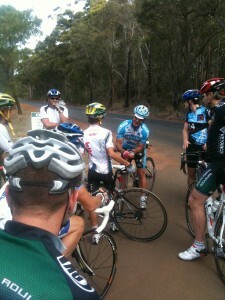 We rode with members of the South West Cycle club who were going to lead the way. Was a great afternoon ride. Some nice downhill. Some nice uphill sections and just different country side. Due to the fact we were out on country roads we have Paul dedicating himself to being the follow car for the weekend. Both being there if we need anything and slowing up traffic behind us. A luxury that would probably see him get rammed if we were in Perth. But down here drivers seem to be patient and appear to give us room. We also look very pro with a car shadowing us 🙂 Very cool. After around 61kms we arrived back at the camp after a great ride and great first day. Everyone one had managed to feed themselves. Some better than others. I think tomorrow night and Sunday I will just go into town for dinner will be so much easier. Sitting here now writing this some have got their kids to bed others still working on that while some of the adults are sitting around talking shop. That is all I have to say for the first day of the easter camp. Soon I think it might be time for bed.